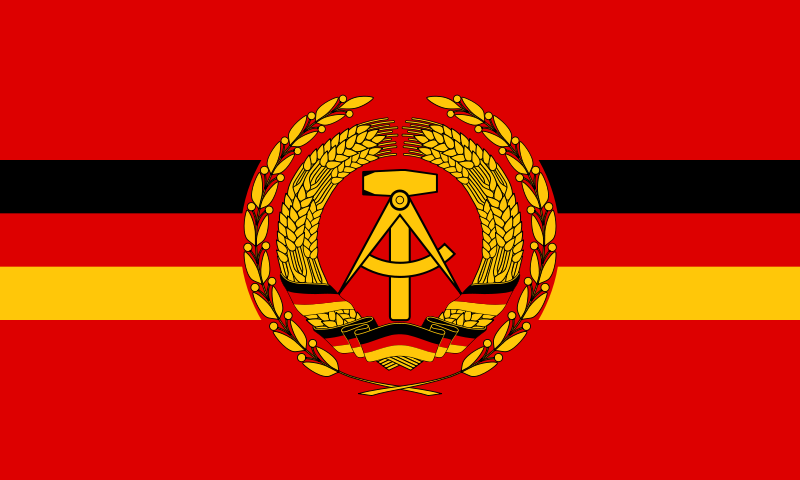 Probably the smallest of the branches of the East German National Volksarmee, the Volksmarine was the naval force of the East German armed forces. Following lessons learned during the fight against the Nazi Kriegsmarine, when the Soviet Union began rearming the East German state it imposed strict limitations on the numbers, types and displacement of vessels operated by the East Germans. During the Second World War, Nazi submariners wreaked havoc on allied shipping so in the postwar years the Soviets were reluctant to arm the Volksmarine with submarines. Thus was one of the main differences between the East German Volksmarine and its West German Bundesmarine counterpart. While the West Germans operated several squadrons of submarines and destroyers, the heaviest ship operated by the East Germans was a small number of frigates. Initially the Volksmarine was created in 1950 as the Hauptverwaltung Seepolizei (Main Administration Sea Police), which was renamed Volkspolizei-See (VP-See) (People's Police - Sea) on 1 July 1952. Around this same time the maritime police force was reorganized to include the newly established Grenzpolizei-See (Border Police - Sea), to guard the East German state’s sea frontiers, alongside the Deutsche Grenzpolizei(German Border Police) that had been established in 1946. On 1 March 1956, East Germany formally created its Nationale Volksarmee, and the VP-See became the Verwaltung Seestreitkräfte der NVA (Maritime Forces Administration of the NVA) with about 10,000 men. In November 1960, these maritime forces of the National People's Army were officially re-designated as the Volksmarine (People's Navy). Over the next years the navy gradually received a number of new ships, mostly built in the GDR. Only the coastal protection ships and some of the fast torpedo boats were provided by the Soviet Union, as were all helicopters, and some auxiliary craft were purchased from Poland. When the Berlin Wall was erected in 1961, the Volksmarine absorbed sea going units of the Grenztruppen and the Grenzbrigade Küste der Grenzpolizei (GBK) (Coastal Border Brigade of the Border Police) was tasked with patrolling the maritime borders of East Germany in an attempt to prevent defections into the West. The uniform displayed here shows Dienstuniform (Service Uniform) of an Oberleutnant zur See (First Lieutenant) in the East German Volksmarine.The uniform is made of the distinctive navy blue gabardine material and unlike the Army, Air Force and Border Troops the uniform does not utilize a system of waffenfarbe designations to distinguish its personnel. Instead it utilizes a system of shoulder epaulettes, service stripes and a sleeve badge to distinguish its troops. The visor cap shown here for a junior officer in the Volksmarine. Note the version of the national roundel insignia worn by the Navy with the hammer and compass logo surrounded by a wreath in gold instead of the silver utilized by land based forces. Also of note here is the gold braiding along the brim of the visor cap distinguishing this as the cap of an officer. Note the standard interior marking of NVA for the East German National Volksarmee. This visor example shown here carries a letter 'P' designation meaning the visor was manufactured in 1986. The number beneath the NVA stamp represents the size of the hat in centimeters, this example is 56cm or roughly 7in by American sizing equivalents. Here's a close up view of the national insignia worn by the Volksmarine. Note its distinct gold construction complete with the wreath of an officer. Here's a close up view of the junior grade officers braiding of the caps of the Volksmarine. Shown here is a close up of the shoulderboard insignia for a Oberleutenant zur See in the Volksmarine with the silver officer braiding of the shoulderboards and three gold pips of a junior officer. The title of 'zur See' is a designation entitled only to naval personnel signifying their service in the maritime forces. Instead of the Kragenspiegeln associated with other forces, shown here are the service strikes and sleeve insignia of a Oberleutnant zur See (First Lieutenant) of the Volksmarine Administration service. The administration service badge appears to show a sword with wings surrounded by interlocking snakes climbing to the top in gold embroidering against a navy blue backdrop. Below note the two gold service stripes of a junior grade officer in the People’s Navy. Here is a close up of the arrangement of the Navy uniform tunic ten button arrangement unique to Naval service uniforms. They feature gold buttons complete with a naval rope and anchor reminiscent of Naval forces around the world. The uniform would be worn with a white undershirt similar of all NVA issue dress shirts, it would retain the shoulder loops for the wearing of shoulderboards on the shirt and also with a dark navy blue tie. Shown here are the Navy blue trousers worn by the Navy. Note that they are unpiped. Here's a shot of the interior tag of the pants displaying them as a size SG-52. The SG standing for A person of tall height and the 48 being equivalent to 33-36in American waist equivalents. Shown here is the alternate cap worn during the winter. It is the standard issue synthetic fur winter hat with a gabardine crown in navy blue color. 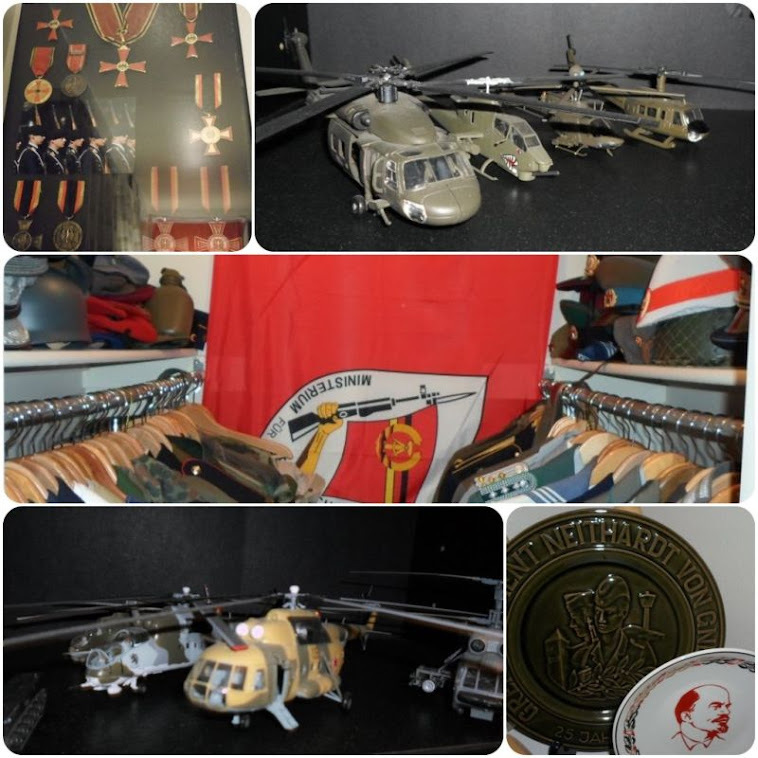 Note it retains the gold coat of arms of the East German Navy in the center. The coat of arms in this arrangement is specified to officers in the Volksmarine. Here is the NVA stamping on the interior of the hat showing it as with the visor hat 57cm or roughly 7 1/8 in by American sizing equivalents. It carries a letter designation of ‘U’ for its 1978 date of manufacture. The number 1856-101 is the inventory/stock number of the cap.